Chimere was perhaps the cleverest and most ambitious of the Direnni summoners. He sometimes claimed to have been quite fond of cats, having once possessed litters of kittens. Chimere tricked Dagon into swearing an oath against the Powers which he had no intention of keeping, then used the Saviour's Hide to turn Dagon's titanic fury long enough for Chimere to deliver his own attack -- an incantation invoked upon Dagon's "Protonymic" (i.e., Incantory True Name) which would gradually drain all of Dagon's power into the void. Chimere miscalculated, however, not realizing that Dagon's resistance could slow the draining of his power, even if it could not stop it. As a result, Dagon had the time to curse Chimere with a literal fulfillment of the terms of his bargain with Chimere. Rather than let his power drain into the void, Dagon cast it all into his curse. As a result, Caecilly Island was cast into the void, all its citizens were horribly slain, and Chimere was condemned to live forever among the ruins of his greatest ambition. Chimere also studied the legendary Spear of Bitter Mercy. Chimere thought Dagon had Caecilly Island established as the site of the Chapel of the Innocent Quarry to personally mock and torment him. The green crystal structure was created by enchantments, and was the only building on the island erected after it was ripped from Tamriel and loosed in the void. During the Imperial Simulacrum, after many failed attempts, Mehrunes Dagon successfully invaded the Battlespire. Chimere encountered an apprentice battlemage from the Battlespire who had entered the realm from the Shade Perilous while following Dagon's retreating armies. 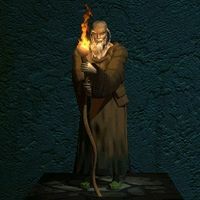 Old Man Chimere gave the young hero the information needed to escape the realm and ultimately defeat Dagon. It's unclear how long Chimere has been in the Chimera of Desolation. His journal, as paraphrased in Battlespire, was titled "Harvest's End, 3E 172". This text later appeared in TES III: Morrowind as "Tal Marog Ker's Researches". The text appeared again in ESO, which took place circa 2E 582, with the title Harvest's End, but with no author or dates given. This is muddied further by it being unclear if time in Oblivion and time in Mundus have any kind of linear relationship. A son of Chimere is known to have survived past the time of the Imperial Simulacrum and spread the tale of the recovery of the Battlespire. Old Man Chimere estimated that he had anywhere from one child to two thousand. For game-specific information, see the Battlespire article. ^ a b Chimere Graegyn's dialogue in Battlespire.